Dead legs may bring a gruesome image to mind, but in the context of water borne pathogens, it has another negative connotation. The term “dead leg” is actually used to describe a potable water piping configuration in a distribution system where water flow has ceased. Why does this create a potential health problem? Dead legs are sections of potable water piping systems that have been altered, abandoned or capped such that water cannot flow through them. This includes isolated branch lines, pipe sections with closed valves and pipes with one end capped. Dead legs experience periods of no flow which leads to stagnation. Basically any closed valve not connected to a fixture, appliance or piece of equipment can be considered as a dead leg. 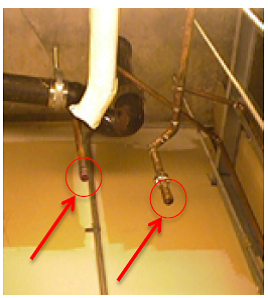 Dead legs may be intentionally installed to facilitate future expansion of a building’s potable water plumbing system in order to avoid a complete building outage. Dead legs can be roughed in to provide options for future construction or anticipated needs. In many cities, underground dead legs were installed to facilitate potable water infrastructure expansion systems. Functional dead legs can result from lack of use, such as when different wings of a hospital or floors of a hotel are closed due to low occupancy. While dead legs themselves are not directly harmful, they create a stagnant condition, which can in turn support microbial amplification, including Legionella. In these areas of low or no water flow, the residual disinfectant present in the water to inhibit the growth and amplification of Legionella and other waterborne pathogens can be quickly reduced. Once the disinfectant is consumed, and no other water and disinfectant is introduced into the piping due to lack of flow, Legionella and other waterborne pathogens can amplify. Biofilm can accumulate in areas of stagnation, low flow or eddies which can also contribute to a host of other issues. By design, dead legs are rarely found in modern, single family homes. Commercial buildings, multifamily residential and senior living centers are far more likely to have dead legs. Buildings undergo frequent modernization, remodeling and tenant improvements, which mean potable water plumbing changes can result in dead legs. Hospitals, hotels or other buildings can become offenders since they constantly renovate or expand facilities. Changing use and occupancy or having numerous piping systems connected to equipment and many plumbing fixtures can also be problematic. Those facilities that also serve a population whom are susceptible to contracting Legionnaire’s disease should make every effort to reduce dead legs in their system. Dead legs are not limited to potable water plumbing systems in buildings. Fire hydrants, by virtue of their installation as standalone devices, could also be considered dead legs. 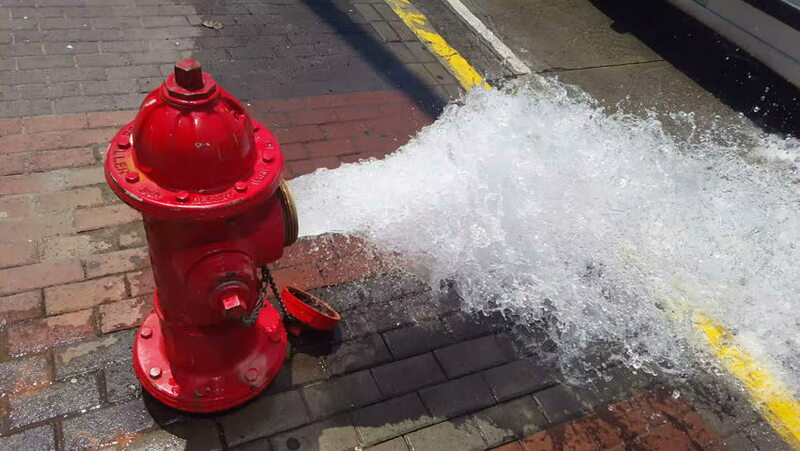 Unless the fire hydrant is in active use, there is no flow through a fire hydrant. Water sitting inside the branch piping to the hydrant is rarely used and can become stagnant. When the water is released from the fire hydrant, it is released with such force that the stagnant water is aerosolized, creating a Legionella exposure scenario. Identify the areas in your water systems where the water may stagnate, like dead legs or in storage tanks that are not frequently used. In areas of low use, periodically open all faucets, shower heads or other fixtures to flush water through the pipes. Remove dead legs and unused equipment and water lines from the system. When installing piping for future use, install a valve as close to the main water pipe as possible to cut off water to the potential dead leg. When removing a fixture from an existing plumbing system, such as removing a kitchenette from a closet, turn off the valve at the main water pipe and open the fixtures to remove any standing water prior to capping the pipe. Identify and test the integrity of all backflow preventers per local code requirements. Overall, the building potable water system should be routinely evaluated for stagnation. Chlorine or other disinfectants should be administered to prevent Legionella and other waterborne pathogens from amplifying.